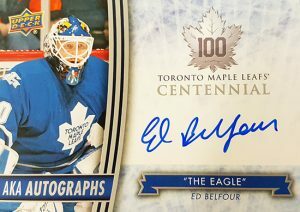 2017 Upper Deck Toronto Maple Leafs Centennial - Checklist	Overall rating:	0	out of 5 based on 0	reviews. 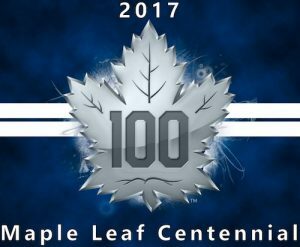 2017 Toronto Maple Leafs Centennial is an Upper Deck product celebrating the 100th anniversary of the fabled NHL team. 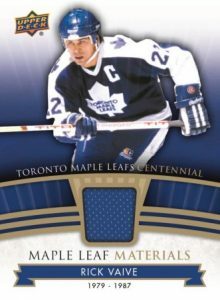 This product closely resembles the set released in 2008-09 for the Montreal Canadiens centennial celebration. 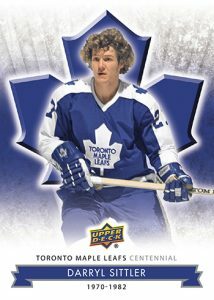 Fans can expect to find autographs and memorabilia of some of the best players the Leafs have ever produced. The product will be released in 4 formats, hobby, retail box, blaster, and retail tin. Collectors who purchase the tin format will receive a replica mini-banner celebrating one of the team’s Stanley Cup Championships.